The East Meadows, September 2008. 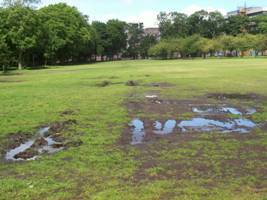 Over the years we have seen parts of the Meadows steadily deteriorate because of inappropriate use. The result is a large area being unusable for much of the time. We are now asking the City of Edinburgh Council to limit events on the Meadows to events which are suitable and appropriate. The Meadows is a great place for all sorts of events, many of which do no damage and are enjoyed by lots of people. 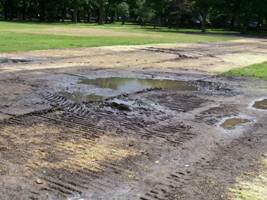 In the past, events such as Fringe Sunday, The Meadows Festival, and Make Poverty History, have worked well on the Meadows, but events which have big tents and stay several weeks have caused lots of damage. It is easy to see from past experience which types of events are good for the Meadows, and which are bad. One of the principal arguments for putting events on the Meadows is economic. We have looked at the figures and here is what we found. By joining the Friends of the Meadows and Bruntsfield Links you can help form our policies, and make us more representative of the community. The City of Edinburgh Council will then have to take more notice of what we say. Email the membership secretary at membership@fombl.org.uk. Despite our objections, the Licensing subcommittee has allowed the Ladyboys of Bangkok and the Moscow State Circus to use the Meadows in August. The "Festival Funfair" (Evans Funfair) has also been granted a licence to operate on the Meadows in August. Since the area they used last year hasn't fully recovered yet, they are using a space near the Cricket Pavilion, so damaging another piece of the Meadows. Ensure that any conditions imposed on this year's events are adhered to in full to minimise damage. See what we have been told. Press for full and proper reinstatement of any part of the Meadows damaged by events - even if it means ploughing it up to decompact it before returfing. Urge the Council to introduce an events policy which does not keep on causing damage in the way previous events have been allowed to. See Meadows Manifesto on the Home page. Or you could write to the Scotsman or the Evening News. and the Evening News, 4th May.